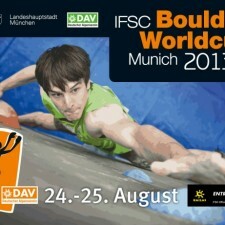 The 2013 Bouldering World Cup continues this weekend in Munich, Germany after a long hiatus1. Of particular note for American viewers is the addition of three Americans to the start list in addition to mainstay Alex Puccio. Megan Martin, Kasia Pietras and Vaysa Vorotnikov have all made the journey to Munich to compete against some of the world’s top boulderers. Unfortunately for the American audience the qualifying round for the men starts Saturday morning at 4 AM EDT while the women start their qualifying round at the more agreeable time of 10:30 AM EDT. Semi-finals get underway Sunday morning at 5:30 AM EDT with finals to follow at 12:30 PM EDT. Watch each round below.